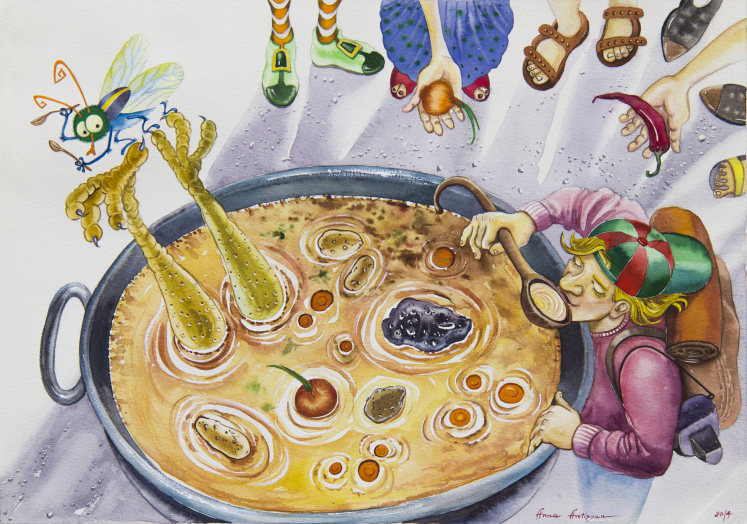 One of my most cherished fables is the story of Stone Soup. Some travellers come to a village, carrying nothing more than an empty cooking pot. Upon their arrival, the villagers are unwilling to share any of their food stores with the hungry travellers. Then the travellers go to a stream and fill the pot with water, drop a large stone in it, and place it over a fire. One of the villagers becomes curious and asks what they are doing. The travellers answer that they are making “stone soup”, which tastes wonderful, although it still needs a little bit of garnish to improve the flavour, which they are missing. The villager does not mind parting with a few carrots to help them out, so that gets added to the soup. Another villager walks by, inquiring about the pot, and the travellers again mention their stone soup which has not reached its full potential yet. The villager hands them a little bit of seasoning to help them out. More and more villagers walk by, each adding another ingredient. Finally, a delicious and nourishing pot of soup is enjoyed by all. The world is proving to us on an almost daily basis, that good fortune, happiness and well-being are gifts, not entitlements. In the spirit of what is received it is also important, vital even, to give. And it is not necessary to look any further than our own community. It may be uncomfortable to look around at first. We’ve been conditioned to keep our heads down and noses to the grindstone. I can almost assure you that there is someone you pass by every day who hasn’t eaten that day and doesn’t know if they will. These aren’t “professional beggars” or scammers, you won’t hear any sob story, they won’t say anything. These are people who live precariously, paycheck to paycheck ( who hasn’t ? ), and for one reason or another that paycheck stopped…very inconveniently as paychecks do when the truck needs winter tires, the propane tank needs filling and the landlord won’t wait. Something has to give. And this doesn’t even address the problem of children who receive some meals at school which are closed for the holidays. Fortunately, there are always a few dedicated souls in every community who take it to task. In nearby, Portola, we have the Eastern Plumas County Assistance Network, better known as EPCAN. “The holiday season is upon us so this means getting ready for our “Holiday Meal Basket” hand out at EPCAN. Times are tough and the cold winter setting in can bring more hardship on those who have been struggling already this year, says site manager and volunteer, Joyce Sears. We at EPCAN will again be handing out a full holiday meal basket to those in need. Last year we handed out over 100 meal baskets and we estimate that number will increase this 2015 season. If you’d like to join in and help with filling the baskets we’d love your support. Our site is open Mon & Wed 9:30 to 11:30 and Tues & Thurs 12:30 to 2:30 @ 120 Nevada Street, Portola. Or you can leave your donation at one of our local stores in Graeagle and Portola where we have boxes set up for donations. We appreciate our amazing community both personally and professionally for its continued support and donations throughout the year to keep EPCAN open and running. Food donations should be of the non perishable variety, but outside of that, let your imagination and unique culinary skill express itself. What would you put out for a holiday feast? And while cans of creamed corn will be joyfully received and distributed, I have a feeling that my audience here can come up with something shall we say, a little less bland? EPCAN also gratefully accepts cash donations. Checks mailed in should be made payable to EPCAN and addressed to 120 Nevada Street, Portola, CA 96122. Graeagle Associates maintains its commitment to EPCAN with a pledge of $100 per commissioned sale. This year we are happy to have closed more sales than in recent years, in what appears to be a return to normalcy in our housing market after a long spell of recovery. Happily, this translates into more money for EPCAN. If this sounds a bit like the much maligned “Trickle Down Effect”, I’d have to say that some correlation can’t be denied. 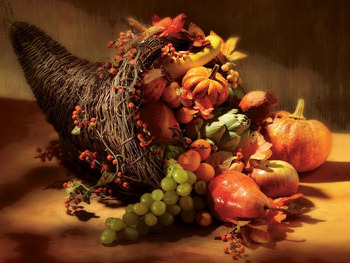 But it only works if people actually feel compelled to let go a bit, to trust a bit, just enough to engage the natural compassion that resides in all of us and which traditionally finds its outlet in this traditional season of giving thanks, Thanksgiving. That’s when the trickle becomes a flood of relief for the people who most need relief. I encourage everyone to throw something into the pot, just a little seasoning for the season. That Stone Soup satisfies more than just the belly. HAPPY THANKSGIVING TO ALL FROM MY FRONT PORCH TO YOURS. ← Is Graeagle Becoming a Ghost Town?